If you’ve done a Target run recently, you may have noticed that the stores are looking a little different. Aisles have been switched, a modern aesthetic has taken hold and everything you thought you knew about your local Target has been turned upside down. The Target in Hicksville is no exception to this renovation epidemic. Customers can expect new lighting, updated order pickup and guest service counters, new merchandise displays and the addition of a nursing space when the renovation is completed later this spring, according to Liz Hancock, a senior public relations associate at Target’s corporate headquarters in Minneapolis. The renovations to Target are slated for completion by the end of spring 2019. 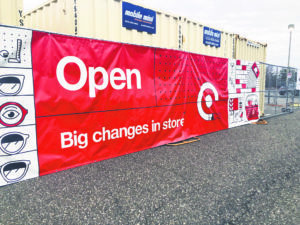 The renovation of the Hicksville store is part of a corporate initiative to reimagine more than 1,000 Target stores across the country by the end of 2020, according to Hancock. The goal is to update the design of the stores to enhance the guest experience. 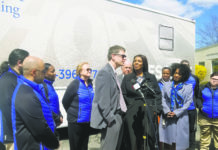 The redesign will feature “modern design elements and bring more technology and digital experience to our stores to make shopping in-store and online even easier and more inspiring for our guests,” Hancock said. The type of changes that will be made in the stores will depend on the needs at specific stores. “We will be choosing elements to create customized concepts to meet the needs of local guests,” Hancock said. 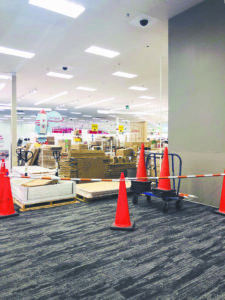 Customers must yield caution as they maneuver around construction inside Target. For the Hicksville store, the décor will be changed and modernized, new aisle signs will appear, product sections are being moved, LED lighting will be installed and a new self-checkout area is being built towards the exit that leads into Broadway Commons. Merchandising displays will exist throughout the entire store, including by the home, apparel and beauty sections “to provide guests with inspiration and style, and help them visualize how to pair products together,” Hancock said. The counter for online order pickup and guest services will also be updated to offer customers faster and easier service. The store will be open during the renovation process, from start to finish. However, some customers are finding it harder to do their regular shopping during the construction. I think it’s disruptive,” a female Target shopper from Levittown said. She is a regular customer at the store and thinks that the selection of products and goods during the renovation isn’t what it normally is. 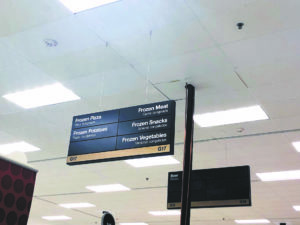 New aisle directory signs have a modern aesthetic. 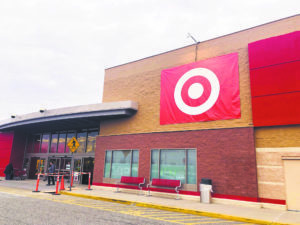 Another customer, a 22-year-old man from Hicksville who frequently shops at Target, also found it troubling to do his usual shopping routine because of the renovation. “I can’t find what I need anymore; they are moving things from one day to another and I have to run around and look for it,” he said. While some shoppers are less happy to do their shopping while the store is being renovated, customer Kristen Cruz and her two kids from Oyster Bay like that changes are being made. Cruz shops at Target occasionally, mostly purchasing toys and gifts. While standing by the toy section on a recent evening, she thought it looks very nice. “The aisles are wider; it has always been hard to get the cart around. It’s brighter and it looks more organized,” she said. Ida Ynner Lagerqvist is a journalism student at LIU Post.